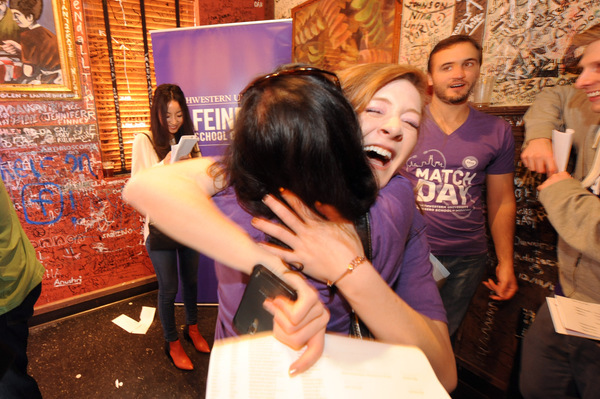 Match Day is held on the third Friday of March at the same time at medical schools across the country: all at once, students find out where they will spend the next three to six years as residents. At 11:30 am, Bramble and Gomez opened their envelopes; Gomez matched at University of California San Francisco in Family Medicine, and Bramble at Children’s Hospital Oakland in Pediatrics. 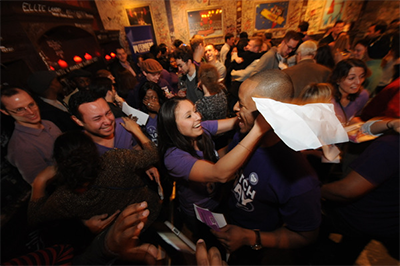 Teresa Gomez and her fiancé Manuel Bramble celebrate Match Day at Gino’s East in Chicago after learning where they were matched for residencies. On Match Day, results of the National Residency Matching program are announced simultaneously across the country. Bramble and Gomez met before their first year of medical school, during Feinberg’s Second Look event for accepted medical school applicants and started dating two months into the year. They plan to marry in May. This year, an all-time high of 1,035 couples participated in the match with a 94.8 percent match rate. Participants who enter the match as a couple agree to have their lists of preferred residency programs linked to each other so they can try to match to a pair of programs that suits their needs. More than 93 percent of U.S. medical school seniors matched to residency positions this year, and the total number of match registrants topped 41,000, the largest number on record, according to the National Residency Matching Program (NRMP). Jackson matched at University of Illinois College of Medicine in Psychiatry. When creating her rank list, Jackson prioritized the culture of a program. Senior medical students congratulate each other at Match Day. This year, more than 41,000 medical students nationally matched with residency programs, an all-time high. Conducted by the NRMP, matches are made by using a computerized mathematical algorithm to align the preferences of applicants with the preferences of residency program directors to fill the training positions available in U.S. teaching hospitals. “All the work and dedication from your entire education has led you to this moment,” said Paul Devlin, a fourth-year medical student. He matched at Northwestern in Cardiothoracic Surgery. “Medical school teaches you a framework and how to think clinically, but you also learn how much it is that you don’t know – but will learn during your residency and career. I’ll always look back on my time at Feinberg fondly and I wouldn’t have traded it for anything,” Devlin said. View a full list of 2015 match results. View photos from the 2015 Match Day event.